Athletics: Cayenne caper - Is Cajun sports mascot dead or alive? Can the University of Louisiana at Lafayette’s nationally known spirit leader somehow be rescued and revived, or is it time for a proper burial? The questions are ones new UL athletic director Bryan Maggard suspects must, and will, be answered at some point. And branding was a huge part of ex-University of Missouri athletic director Mike Alden’s six-month examination of UL’s athletic department. Completed prior to the hiring of Maggard, who inherited a lengthy to-do list, the study made several recommendations that either still are unaddressed or just now are being acted upon. Also among them are many related to marketing, game-day operations and ticket sales issues, as outlined in a report from Alden that was made public a little more than a year ago. The Alden Report recommended development and implementation of “comprehensive” marketing and sales campaigns for football and men’s and women’s basketball. Shortly after Maggard’s March arrival, UL did begin its 2017 football season-ticket sales campaign — and there are plans for a similar basketball campaign. Maggard set a goal of 14,000 season tickets sold for football in the season to come, which would be higher than the existing record in the 13,000-range and significantly more than the last season’s total in the 9,000-range. UL recently surveyed a sampling of fans and season-ticket holders, seeking their suggestions, input and opinions. Results of that survey, Maggard said Monday, are being studied now. “What we’ve been discussing in great depth is making sure we improve the game-day experience for our fans,” Maggard said. Maggard is well-aware of what he calls the “strong tailgating tradition” of Cajun football fans. But he suggested there’s a need to guide more tailgaters from their parking-lot spots into Cajun Field, then keep them inside the stadium once they’re past its gates. “We just need to make sure … people want to stay in there, and have the best experience they can,” he said. As for whether or not Cayenne will ever roam again at Cajun Field, or in the Cajundome for basketball games, it’s uncertain. Some suspect he’s long gone and already has joined Mr. Ragin’ Cajun and the Fabulous Cajun Chicken among the list of late Cajun mascot-like characters. Suspects in Cayenne's disappearance seem tied more to Martin Hall, the school's administration center, than the athletic department, although The Daily Advertiser reported in September 2014 that UL president Joseph Savoie wasn't aware he was missing someone brought it up at a student leadership meeting. FROM THE ARCHIVE: Where in the world is Cayenne? The fiery, larger-than-life hot pepper has haters and backers alike. 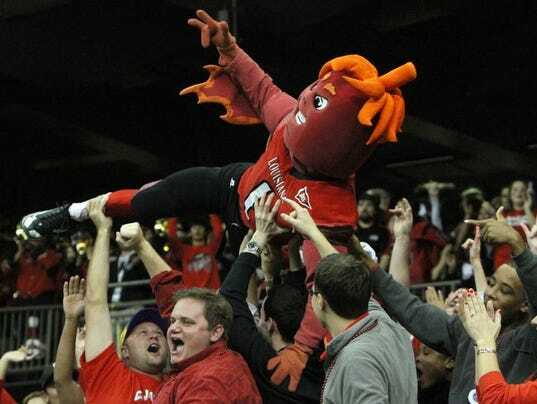 In 2010, TopTenz.net listed Cayenne as one of its “Top 10 Bad College Mascots,” and in 2015, even while in apparent exile, he was voted the 21st-worst college mascot according to Sportspickle.com. But in 2014 the Daily Advertiser reported Cayenne — born sometime around 2000 — had gone missing because of funding issues, and that it would cost about $16,000 for two new costumes needed to replace ones that had become worn out. Whether or not he’s resuscitated is one of many to-be-addressed matters on the UL athletic department's crowded plate. One Alden Report recommendation was to develop a licensing strategic plan, but there’s been little or no progress on that. Another was to create a committee to focus on maximizing brand potential. Maggard said that hadn’t occurred prior to his arrival, but he readily acknowledges that branding is a key component for the program going forward. In recent years the program has been embroiled in a name controversy, with the university’s sports teams wanting to be known as the Louisiana Ragin’ Cajuns — not Louisiana-Lafayette, or other variations including ULL and UL-L. In-state rival UL Monroe and others initially put up strong resistance to the preference for using "Louisiana," but ULM’s fight seems to have simmered lately. The Sun Belt Conference’s reference guide, in fact, now advises use of “Louisiana” for the school. Some media entities, meanwhile, often use logos from years gone by; one, ESPN, frequently has incorrectly used the logo of a lower-level school from Pennsylvania, Lafayette College, instead of UL’s for TV graphic purposes. Maggard was familiar with UL’s stacked "Ragin’ Cajuns" logo prior to his arrival — one that uses a small pepper as an apostrophe, with one word positioned above the other. But he knows several others have been used as well. “We will help ourselves greatly, I think, from a brand standpoint if we as a group internally can solidify our pick,” the athletic director said. His fate, however, is a hot-pepper topic that officially remains unresolved. If one addendum page in the Alden Report offers any insight, though, funeral plans indeed may be in order. If, that is, one hasn’t secretly been held already. Click here for the Mascots and Traditions Photo Gallery to view Gee the Bulldog and others since that time.